Check out the free Marco Polo App! Discover the World with Team Marco Polo! Art, Language, Culture, History and Pies in the Face! Plus a bunch of cool songs and jokes. Team Marco Polo is produced by a creative team that has developed bestselling media for popular kids’ shows like Beakman’s World and Bill Nye, The Science Guy. To learn about the world is to learn about yourself. So keep exploring the world from your mobile device and Team Marco Polo! 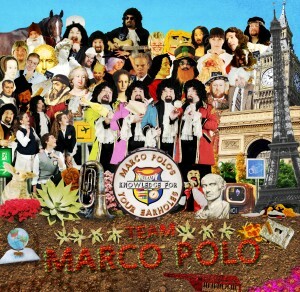 12 new songs from the Team Marco Polo show rolled into one incredible album! Available soon on our iTunes page!